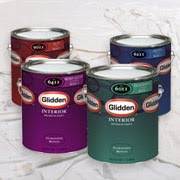 Home Deport is offering Glidden Interior Paint for only $14.97 per Gallon Can. Many Home Depot paint deals involve a rebate, but this special allows you to save up to $5.50 per gallon instantly on Glidden Interior Paint in semi-gloss, eggshell, flat, and satin finishes. This offer is valid from 2/11/10 through 2/17/10. Available In Stores Only.